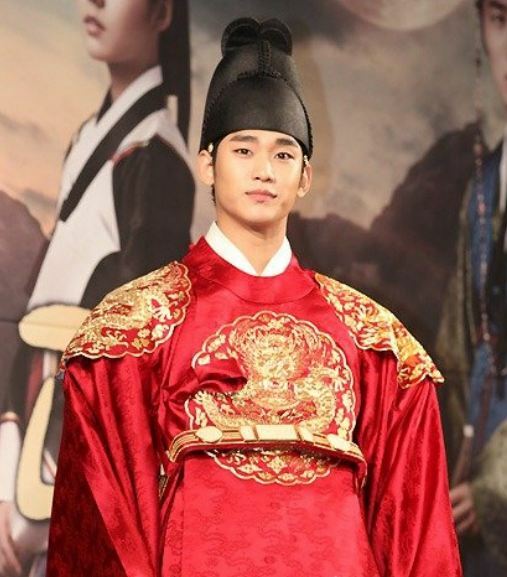 Kim Soo Hyun who is shooting historical drama for the first time since his debut talked about his feelings. On January 2nd, 2012, Kim Soo Hyun attended the production press conference for MBC new Wednesday and Thursday drama series The Moon the Embraces the Sun (The Sun and the Moon) at 63 City on Yeouido island, Seoul. Kim Soo Hyun said, “I have never lived as a king before, so I studied many kings available thus far.” He continued with a laugh, “If I have to choose a predecessor of king as role modal, it’s the young king known as Song Joong Ki.” Song Joong Ki previously played the role of young Lee Do (King Sejong) on the ended series Deep-Rooted Tree. In order to look like an old king, ‘he tries not to smile,’ attracting attention. Kim Soo Hyun said, “Working hard to be seen as presbyopia.” He continued, “I felt sorry when having a photo time, as I try not to smile to look like an old king. I look a lot younger than my role when smile,” arousing laughter. Continuing, “There have been many kings in different images so far, but I will show a different image of king, please believe me,” provoking laughter. The Moon that Embraces the Sun is adapted from same-name novel of Jung Eun Gwol, who also wrote Sunkyunkwan Scandal. It’s a romantic historical drama that tells the love story of crown prince Lee Hwon in Joseon Dynasty era and Yeon Woo who becomes a shaman after losing her memory. The drama debuts January 4, 2012.